What is a Data Export Service? What Happens if You Forget Your Password? What Exactly is SIEM and SIEM Integration? Twitter is a social news and networking site with more than 300 million active users each month. 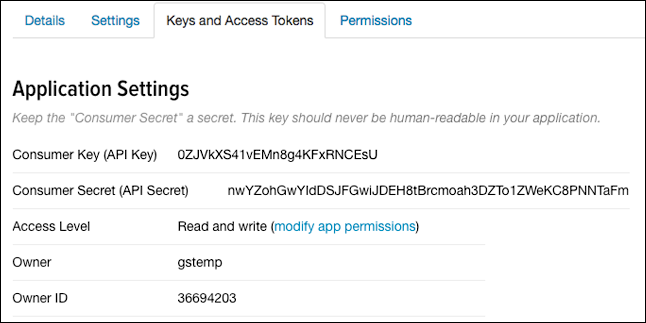 Obtain a Twitter developer’s account from https://apps.twitter.com. 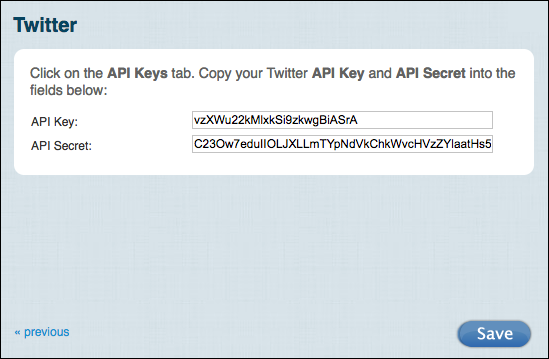 Open a previously-created Twitter app, and copy the consumer key (API key) and consumer secret (API secret). Create a new Twitter app and copy the consumer key and consumer secret. 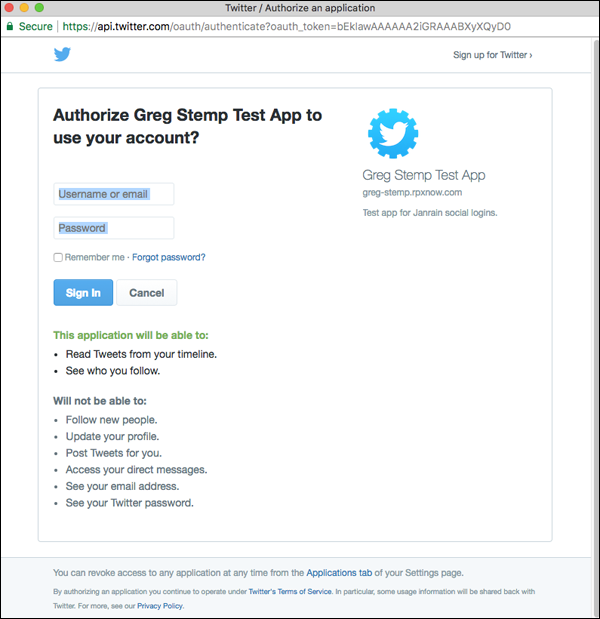 Use the Social Login Dashboard and the Twitter consumer key and consumer secret to configure Twitter as a social login provider. 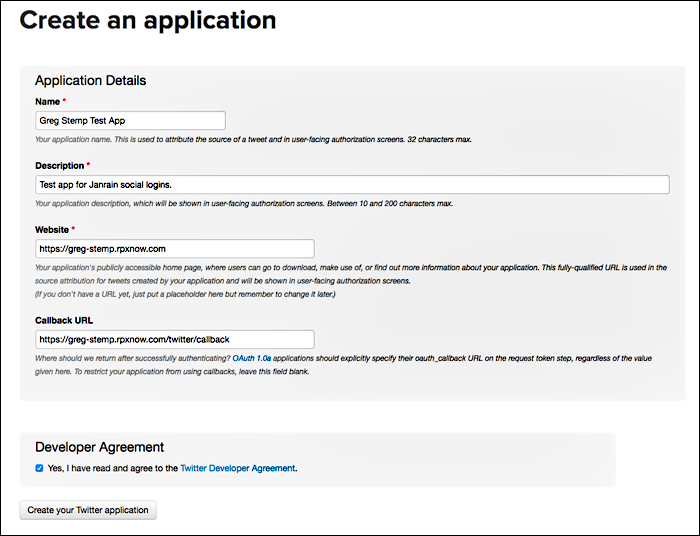 This section walks you through the process of creating a Twitter app for social login. 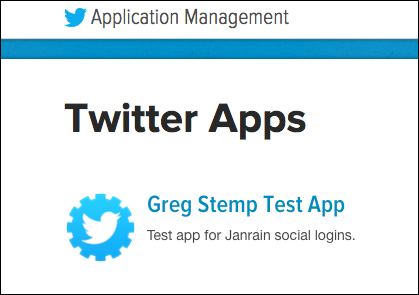 If you already have an app, see the Using an Existing Twitter App for Social Login section of this documentation. Log on to the Twitter Apps (https://apps.twitter.com) site. The name of your application in the Name field. A brief description of your application in the Description field. The URL of your website in the Website field. Your Twitter callback URL in the Callback URL field. 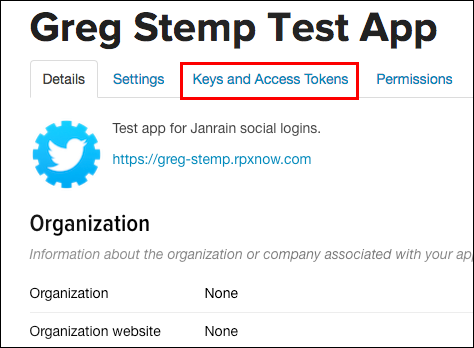 If you are using an Identity Cloud domain, your callback URL will look similar to this: https://greg-stemp.rpxnow.com/twitter/callback. Log off from Twitter Apps. Log on to the Twitter Apps home page (https://app.twitter.com). 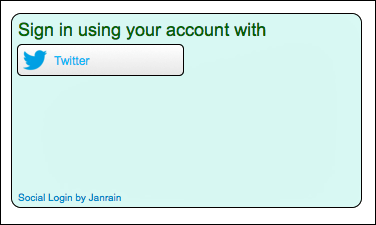 Log on to your Social Login Dashboard (https://dashboard.janrain.com). From the Dashboard home page, click the Manage Engage Dashboard icon. From the Engage Dashboard home page, in the Widgets and SDKs section, click Sign-Ins. 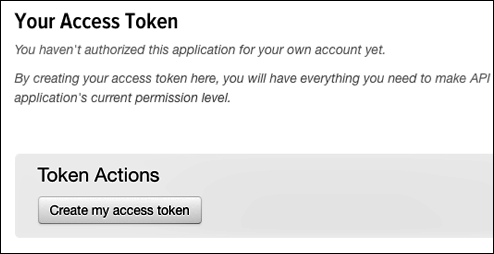 From the Sign-in page, verify that Widget is selected and then expand Providers. From the list of Providers, click Twitter. Paste your Twitter consumer key in the API Key field, paste your Twitter consumer secret in the API Secret field, and then click Save. Twitter appears in your social login widget. When you are finished, select Save and Publish and then click Publish. It might take as long as one hour before Twitter appears as a social login option on your web site. If you have just published your widget settings, click the Test your widget link that appears after the widget has been saved. 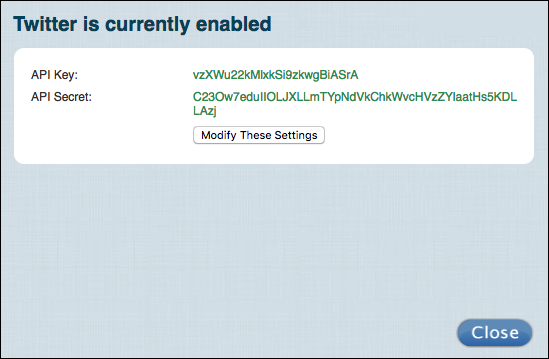 If you previously published your widget settings then, from the Engage Dashboard Sign-in page, click Launch a test widget. The returned profile information will vary depending on the Twitter account used in the test. From the Configure Providers page, click Twitter. To change the Twitter configuration, click Modify these settings. Although you can modify your Twitter settings, you cannot delete those settings. If you delete the settings and then try to save your changes, you’ll see the error message Please enter your Consumer Key and Secret exactly as Twitter shows them. This means that you cannot “unconfigure” the provider: once configured, the Twitter icon will always be shown as green (i.e., configured) in the Social Login Dashboard. In the widget, click the X in the upper right corner of the Twitter icon. Scroll to the bottom of the page, select Save and Publish, and then click Publish. Twitter no longer appears in the sign-on widget. Note. You must always have at least one social login provider in the widget. If you delete all the providers and then click Publish, you’ll see the error message Couldn’t save configuration: No providers.